Take I-15 North to I-215 East. 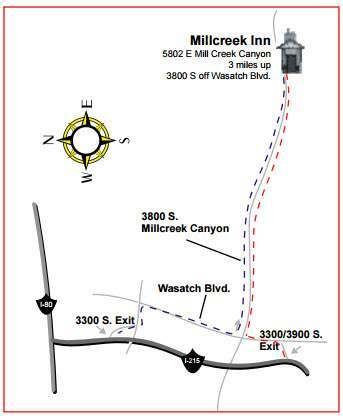 Take the 3300/3900 South exit and turn North (left) onto Wasatch Blvd. Continue to 3800 South and turn East (right) into Mill Creek Canyon. Proceed 3 miles into the canyon. Millcreek Inn is on the right hand side. Take I-15 South to 1-80 East to I-215 South. Take the 3300 South exit and turn East (left) onto 3300 South. Followed by an immediate right (South) onto Wasatch Blvd. Continue to 3800 South and turn East (left) into Mill Creek Canyon. Proceed 3 miles into the canyon. Millcreek Inn is on the right hand side.